Ads in mobile games are more popular than ever. Ads can come in the form of interstitial banners, non-rewarded video, rewarded video, offerwalls, and other native forms. Some games, often casual, can be solely supported by ad revenue. Even for games with options for in-app purchases (IAP), Kongregate typically finds that in-game ads can account for 10-50% of all revenue. This “ad”ded revenue is nice but often lives independently of IAP revenue, typically in the dashboard of various ad networks or your mediation solution. Developers should be looking at both the revenue generated from ads and IAPs in order to determine ARPU, as we do at Kongregate. If you are running paid marketing campaigns for your game, this is essential to acquiring as many new users as possible. Most ad networks will rank your offers against other advertisers' offers based on the CPM cost of your ads (the cost per 1,000 impressions). Even if you are bidding on a cost-per-install (CPI) basis, ad networks will always optimize your campaigns based on the CPMs you generate for them. Demand for ad inventory outstrips supply. Acquisition marketers constantly compete for ad impressions against other games and big brand advertisers. Some of these advertisers are willing to pay premium CPMs and, because supply is limited, they are “winning” the bulk of the ad auctions. This has created an ecosystem where ad display is not linear based on CPM and is actually a power curve in which a few winners take the bulk of all impressions. The minimum viable CPM in a premium country like the United States is ~$10.00; anything lower and you will likely get minimal impressions and traffic. The higher the CPM you generate, the more impressions and traffic you will ultimately receive. If you are not counting ad revenue in those bids, you are not being as competitive as possible. 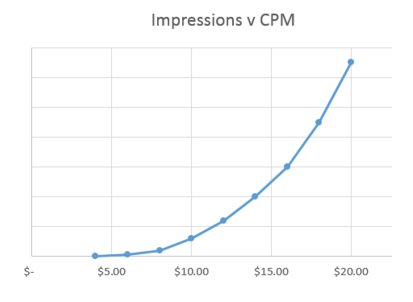 As you can see from the power curve chart above, the difference in impressions (and likely users) between a $10 CPI bid vs $12.50 could net a 100% increase in impressions and traffic. There is always a tipping point where your traffic will increase exponentially relative to the increase in your bid. The easy way to count your ad revenue is to create an association of ad revenue per user: a "revenue per impression" number. Sounds nice, right? Unfortunately, it’s not that easy. Network ad servers are changing bids based on game, geo, CPI bid, click-through rates, conversion rates, and CPM across hundreds, if not thousands, of bidders vying for impressions in real time. Due to these complexities, few networks are able to create a true "revenue per impression" figure. Until this happens, you will have to do some estimation to create a directionally accurate ARPU to maximize your bids. First, create a system to count your in-game ad impressions on a per-user basis (as we do for all Kongregate games). This system should track every ad type individually, as the revenue per ad type can vary significantly. In the example above you can see how the inclusion of ad revenue dramatically changes the value of each marketing source. You can now raise bids where it makes sense to maximize traffic and lower bids that are not profitable. It is important to keep in mind that bids alone do not dictate traffic volume for paid marketing. Your CPM is also determined by the click-through rates of your ads and the conversion rates of your app store page. I will save that for a later post. Kongregate believes in-game ads are a way to drive a substantial amount of incremental revenue. Kongregate makes it a best practice to track all ad types and model out ad revenue by source in order to run the most effective marketing acquisition programs possible. Ads count, so always count your ads. 20 Buzzwords & Other Crap Ad Networks Get Away With Buzzwords are abundant these days. In pop culture it is all about crypto, blockchain, and ICOs. The mobile ads space is no stranger to buzzwords either. A few years ago it was all about "the brands" that were supposedly coming to revolutionize the mobile ad landscape and boost CPMs (they have not). Now we’ve moved onto terms like header bidding, programmatic, flattened waterfalls, and RTB, which will be the next big things on mobile to drive up CPMs. But will they? The answer is that it very much depends on whom you ask and your approach to ads. We Have All Been Getting Screwed... I recently saw a few studies about how programmatic (or header bidding/RTB, same things) boosted CPMs for advertisers by up to 30%. On one hand, that is great news! A new tech (albeit one that has been around on the web for years now) is helping to make the mobile marketplace more efficient and competitive. That is always a welcomed sign, right?